Hazuki Kanae's Sukitte Ii Na Yo (Say "I Love You") was announced as a streaming title very late this season, so it missed being a part of my planned schedule. Crunchyroll finally posted the first few episodes last weekend to let viewers catch up ready for the ongoing simulcast, so today I settled down to see what this new romance manga adaptation was about. Or so I thought, because for some reason Crunchyroll has only posted episodes one, two and four. I don't want to watch out of sequence so I'm going to have to wait until three appears to continue! The show is cut from the same cloth as other recent shoujo titles such as Yamato Nadeshiko Shichihenge (The Wallflower) or Kimi Ni Todoke, by which I mean it's a little more realistic and relatable for older fans than shoujo series of the past, heading towards the increasingly blurry line between shoujo and comics for older women. This kind of series appeals to me as it tends to leave behind a lot of the hysteria and nonsense of shoujo aimed at a younger reader. It's already apparent from the first two episodes of Sukitte Ii Na Yo that male and female characters are perfectly content to talk to one another, kiss and go substantially further, so I'm looking forward to what the future brings. The storyline is very simple so far. Tachibana Mei is a girl who has always been bullied and hurt by people she trusts; consequently, she's decided to go through life without making friends and has given up on ever getting a boyfriend of her own. 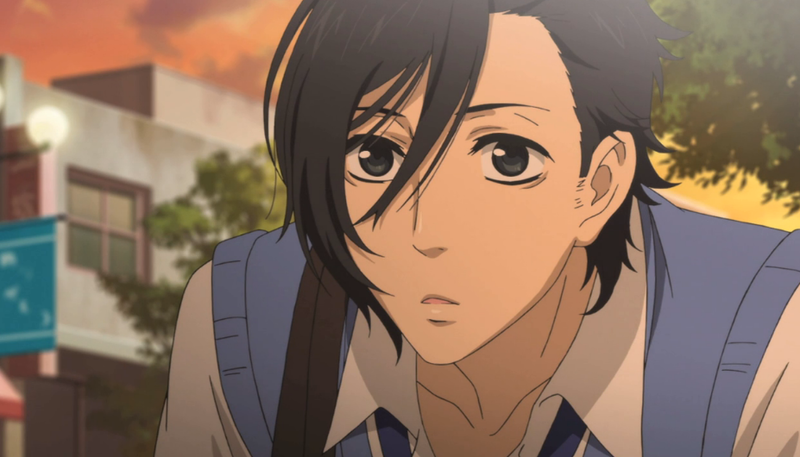 One day, in response to being teased, she ends up accidentally attacking Kurosawa Yamato, who happens to be the most popular boy in her school. 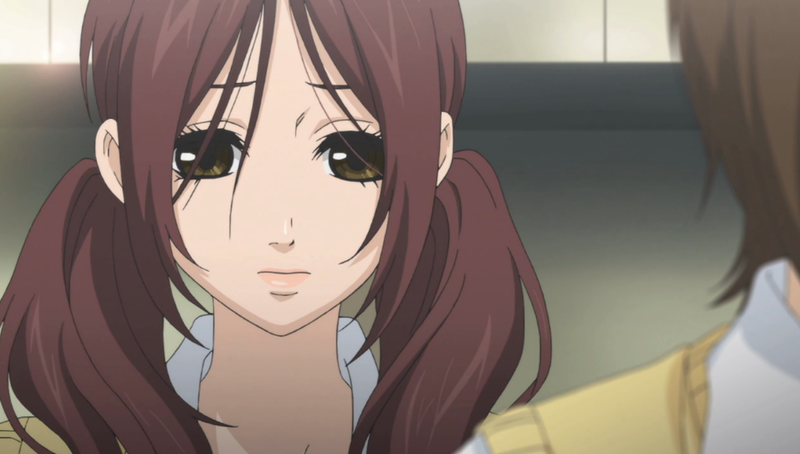 While this doesn't do her already-nonexistent popularity any favours, Mei ends up catching Yamato's eye as a result, and he starts trying to coax her to open her heart to him. I can relate very easily to Mei's attitude at the start of the series, having had an unenjoyable experience throughout my academic life too. She's a vulnerable person despite her superficially thick skin and a lesser series which didn't properly take that into account with her reactions could end up being difficult to enjoy as a result. Fortunately - so far at least - Yamato seems to be a very interesting, nuanced foil to Mei's introversion. Befitting his role as the most sought-after boy in school Yamato is of course an attractive young man (with a mildly irritating, fussy hairstyle), however his defining character trait isn't his good looks but rather his deep, genuine personality. Like the main character, I'm keeping my guard up along as we still don't know much about his circumstances, but so far Yamato's unpretentious outlook has allowed him to break straight through some of the walls Mei has built up to protect herself. It's not long before her heart is wavering for the first time in her life. As is usual for school romance series, most of the other girls are cruel sources of potential bullying. I love the way that they are shown to switch between their natural, bitchy personalities and their cute facades when eligible male characters are around. One strength of Sukitte Ii Na Yo in particular though is how it portrays the boys. There's a danger in many shoujo stories of making the male characters too all-powerful and unrealistic, their characterisation tossed aside in order to make them perfect objects of fantasy for the female audience. Here, the boys are shown to have problems communicating and understanding one another just as the girls do, and even the self-assured ones can be vulnerable at times. It's always interesting to read the video comments on Crunchyroll left by other viewers for female-orientated romance series. I've noticed that whenever there's a low key series aimed at slightly older women, there are a lot of comments from incredulous male American viewers complaining that the story doesn't make sense and the characters are annoying. That's definitely happening here as well; I'm hoping it's a sign I'll enjoy future episodes just as much. One final point to make is that the opening theme is heartbreakingly sung by the immediately-recognisable Okazaki Ritsuko. Friendship was a well-liked song which she originally created for Love Hina. The creators of the series have brought it back as Friendship ~ For Sukitte Ii Na Yo; the blend of sincere singing, a sweet melody and the knowledge that Okazaki sadly passed away at the height of her success makes for an emotional accompaniment to the artwork in the opening sequence. In conclusion, so far I like what I've seen. I hope that whatever the issues are with episode three, they are ironed out quickly so I can continue to catch up with Sukitte Ii Na Yo and add it to my regular weekly schedule.